Some household renovations add cosmetic niceties, such as a new decor. Other upgrades, such as a new roof, may not add curb appeal but are nevertheless important investments for the future. DVD Studio Pro 4 falls into the second category. Last year’s DVD Studio Pro 3 offered some gorgeous new menu-design and slide-show options ( ; September 2004 ). The enhancements in DVD Studio Pro 4 are less cosmetic and more foundational. Because of the nature of DVD Studio Pro 4’s improvements, this upgrade, while excellent, may not be a must-buy for DVD Studio Pro 3.X users. DVD Studio Pro 4 looks and works the same way its predecessors do. You can work in any of three authoring modes—Basic, Extended, and Advanced—which provide varying levels of control over the authoring process. If you’ve used DVD Studio Pro 2 or 3, you’ll feel at home with version 4, but your existing projects might not. Apple changed the way DVD Studio Pro renders text in version 4, and when you open a project from an earlier version, its menu text may require formatting adjustments. Because of this annoyance, I don’t recommend switching to version 4 while you’re in the middle of a project you started with an earlier version. Indeed, if you have complex projects created in an earlier DVD Studio Pro version, it’s smart to keep the older version installed in case you need to burn additional copies of a project or modify your work. Designing Discs DVD Studio Pro 4 lets you mix and match HD and SD content in the same disc. Here, a main menu contains buttons that, when pressed, play either the SD or the HD version of a movie. Unfortunately, Apple makes it difficult to retain this critical tie to your older projects. When you install DVD Studio Pro 4, the installer replaces any previous version. (This occurs with other members of the Final Cut Studio family, too.) It seems possible to retain the older version of DVD Studio Pro by renaming its application icon before installing version 4, though Apple discourages doing so. DVD Studio Pro 4’s product manager told me that the only Apple-recommended method of retaining an older version is to install the new version on a separate startup partition or hard drive—or on a different Mac. Apple’s documentation should mention this. If you’ve created large projects in earlier DVD Studio Pro versions and you anticipate needing to access them again, plan your upgrade strategy carefully: either install DVD Studio Pro 4 on a separate startup drive or partition, or allocate time to tweak your old projects for DVD Studio Pro 4. The most forward-looking addition to DVD Studio Pro 4 is support for high-definition (HD) video. DVD Studio Pro 4 supports HD from several perspectives. For one, you can encode HD video into standard-definition (SD) format, creating conventional discs that will play in all of today’s DVD players. This is similar to how iDVD 5 ( ; April 2005 ) handles HD video, and it’s the most sensible approach for content producers who are shooting in HD but need to deliver projects in a format that most people can actually watch. If you care to tread the bleeding edge, you can create HD-DVDs by encoding your HD video in one of two compression formats: MPEG-2 or H.264. The latter format is the new MPEG-4 variant that’s supported by QuickTime 7. It’s also part of the HD-DVD specification, one of several competing standards for high-definition DVDs. There’s just one problem: no current consumer DVD player can play back HD-DVDs. Manufacturers have shown prototypes at conventions, but you won’t find any players at your local Circuit City. If you burn an HD-DVD, there’s just one place you can play it: on a Power Mac G5 (not on a Power Mac G4 or any PowerBook) running OS X 10.4 and Apple’s DVD Player 4.6. High-definition DVD players may not be common today, but DVD producers who want to be prepared for the future can start now. You can shoot and edit in HD, and deliver mainstream DVDs in SD. And when HD becomes mainstream, you can swap out your SD assets for HD versions, and easily rebuild your project. About those HD discs that play only on certain Macs: they look spectacular. Viewed on an Apple Cinema HD Display, they provide an enticing look at the reach-out-and-touch-it clarity that tomorrow’s HD players will provide. DVD Studio Pro 4 adds a welcome addition to its simulator mode, which lets you test menus and preview your DVD. If you connect a second Cinema Display to your Mac, you can have DVD Studio Pro route its simulator preview to that display. This provides a glorious full-screen preview of HD content. You can also connect an analog monitor for previewing if you have a PowerBook, adapter, or video card with an S-Video output. And if you connect a Dolby decoder to your Mac, you can preview surround sound. DVD Studio Pro 4 is more tightly integrated with Apple’s Motion than it used to be. If you use Motion to create motion menus and transitions, you can set markers in Motion 2 that tell DVD Studio Pro 4 where to loop a menu or switch a transition. DVD Studio Pro 4 also adds a VTS (Video Title Set) editor. If you’re creating complex projects containing numerous scripts and menus, you can use the VTS editor to finely control how the DVD’s data is organized on the disc, thus minimizing delays when a user navigates the disc. 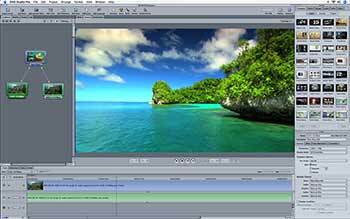 DVD Studio Pro 4 is a jaw-dropping value, offering features that even five-figure DVD-authoring systems can’t match. If you’re setting up your first DVD-authoring system, look no further. But should DVD Studio Pro 3 users upgrade? If high-definition video isn’t on your radar, consider sticking with version 3, especially if you don’t need the VTS editor, Surround Sound preview, and other version 4 enhancements. For producers of workaday DVDs—training videos, weddings, and other events—DVD Studio Pro 3 works just fine. But for independent filmmakers working with high-definition video or Surround Sound, and for game developers creating complex scripts and interactivity, DVD Studio Pro 4 is a winner. It’s a full-featured tool for creating the most-complex DVDs—and a great way to prepare for the age of high-definition DVD.